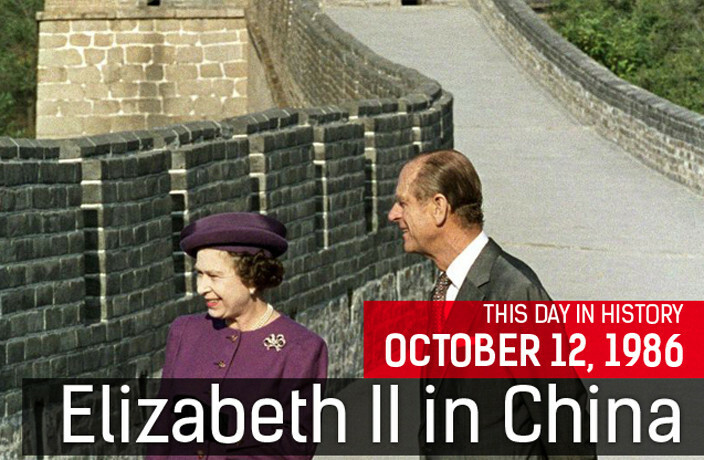 October 12-18, 1986, saw Queen Elizabeth II become the first British monarch to visit China. One of the most important tours she had ever undertaken, it was seen as a critical piece of diplomacy, coming soon after testing negotiations between the UK and PRC over the return of Hong Kong. The 99-year lease of Hong Kong was agreed in 1898 following the signature of the Convention of Peking. In December 1984, Prime Ministers Zhao Ziyang and (a rather reluctant) Margaret Thatcher had signed the Sino-British Joint Declaration, under which the Chinese would resume sovereignty over the territory from July 1, 1997. During her visit, Elizabeth was given access to the newly excavated army of terracotta warriors in Xi’an, being allowed to enter the pit and walk among them, and visited the Great Wall in Beijing. The tour also took in Kunming, Guangzhou and Shanghai, where the Queen invited the upper echelons of the Chinese government to a banquet on board the Royal Yacht Britannia. At an earlier meeting with Deng Xiaoping, Elizabeth had not batted an eyelid when the aging Communist leader had spat into a spittoon that was placed by his seat. Her husband Prince Philip did not show such tact, letting out a guffaw. To watch a short video of the visit, click here (VPN on).